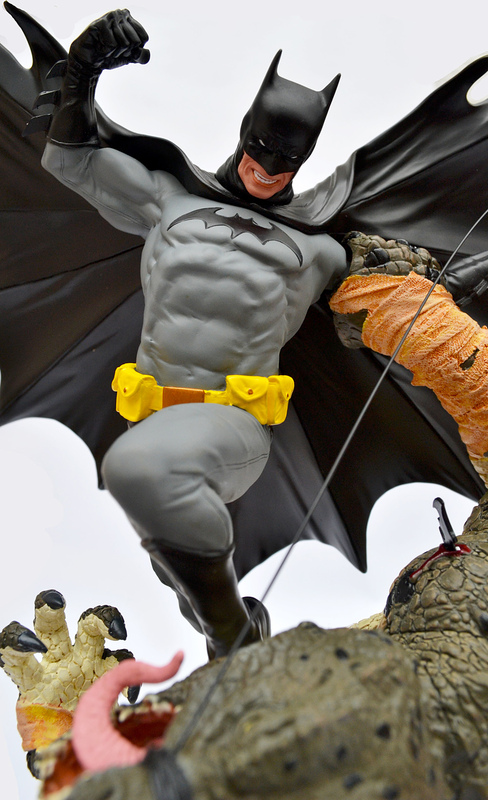 Batman & Killer Croc statue, second edition | 'TAIN'T THE MEAT… IT'S THE HUMANITY! Over the years I’ve been lucky enough to amass a large collection of superhero statues and busts, most of which are of an extremely high quality. 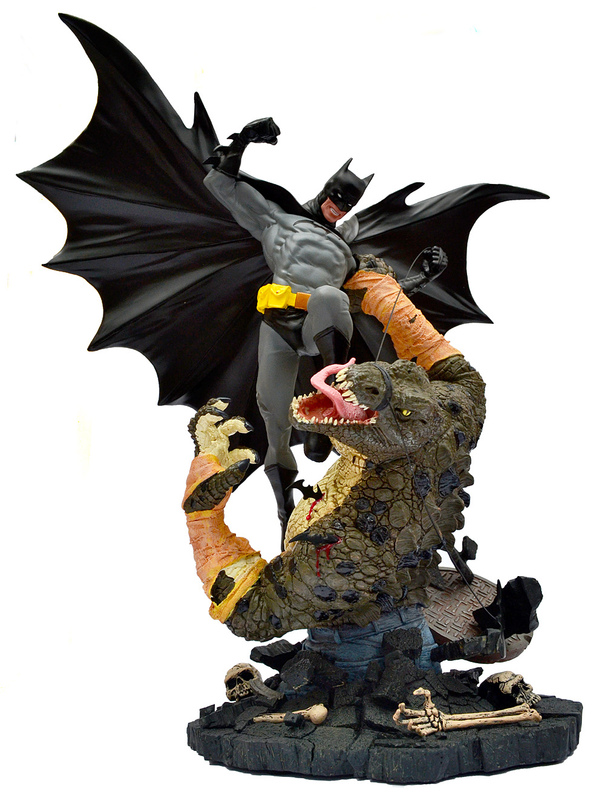 None though have quite the level of bone-crunching impact as this superb Batman & Killer Croc statue from DC Collectibles. 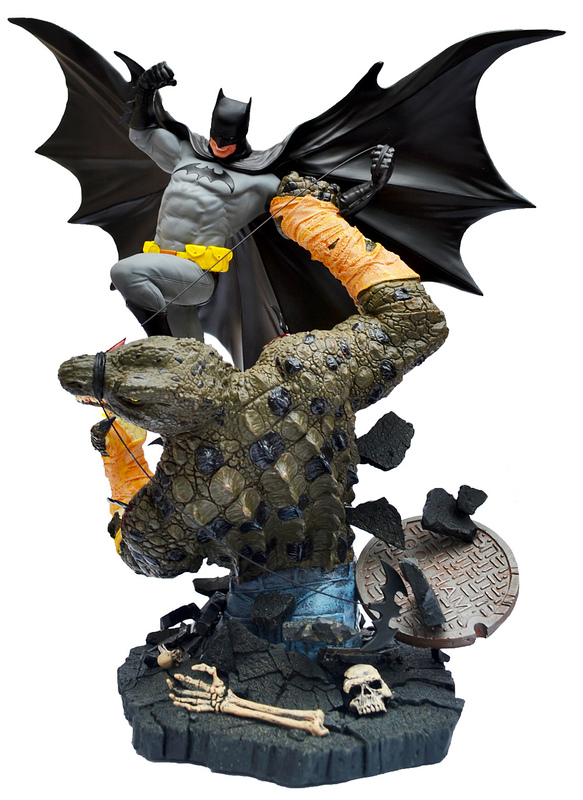 Released in October 2013 this statue depicts a ferocious battle between the murderous Killer Croc — who is shown bursting up through a man-hole cover — and a grim and determined Batman. 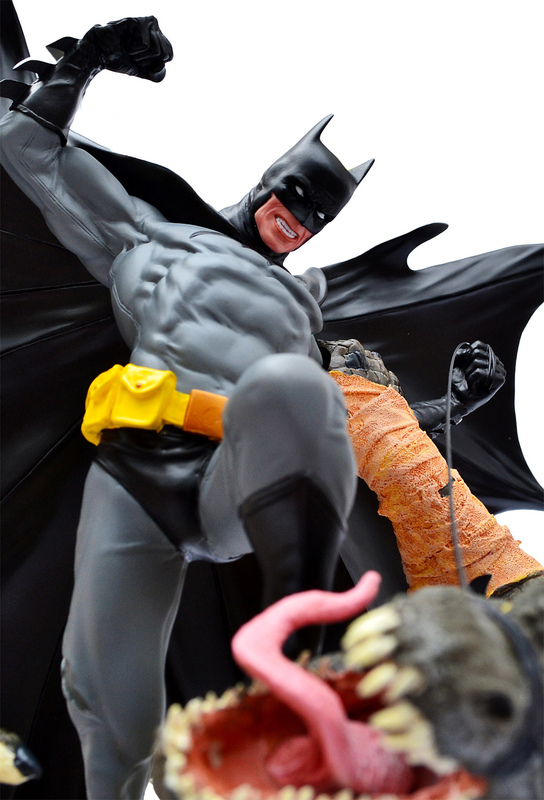 The battle has clearly been raging for some time: Batman’s armour is scored along his legs and Croc’s scaly hide has been pierced by several batarangs, while another is wrapped around his top jaw. The overall effect is electrifying and extremely dramatic. This cold-cast porcelain statue was designed by Walter O’Neal and sculptured by fan-favourite Ray Villafane. Villafane did a great job on the piece and the level of detail is wonderful, from the scales on Croc’s skin to the bones at the base of the statue. There’s even texture on Croc’s tongue — it’s easy to see why Villafane is held in such high regard amongst collectors. Complementing the sculpture is the fantastic paint work of Eddie Wires, who imbues the piece with some wonderfully shaded and nuanced colour work (the bandages around Croc’s wrists and hands, for example, feature multiple shades of yellow and orange). 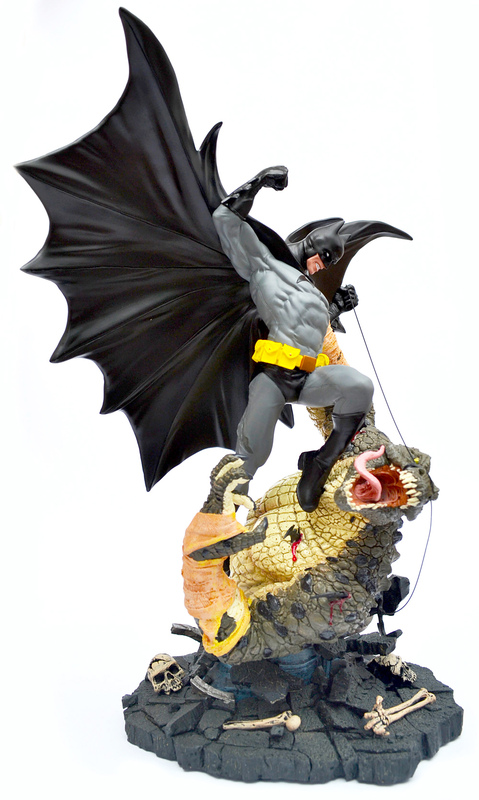 This is the second edition of the Batman & Killer Croc statue, and there are significant difference between this version and the one originally released in 2010. The big change is the colour scheme — the first edition featured a blue and grey Batman, not the black and grey as featured in this version (I much prefer the classic black and grey edition). Secondly, the 2010 edition shipped in once piece, which resulted in breakages, particularly of Batman’s arm. DC clearly listened to fan’s complaints as this second version of the statue now comes in three pieces: Batman (without his left arm); Killer Croc (with Batman’s left arm) and the man-hole cover. To assemble the statue Batman’s left shoulder slots into Croc’s fist, while a pinion in Batman’s left boot slots into a hole in Croc’s chest. The man-hole cover also has a small pinion that slots into Croc’s right hip. Once assembled the seams between pieces are invisible. The last difference is the 2010 version was a limited numbered edition of 1,500 pieces (which shipped with a certificate of authenticity) while the second edition isn’t a limited run. I like numbered editions as much as any collector but the lack of such doesn’t diminish my enjoyment of this statue in the slightest. Adding to the statue’s impact is its size — it measures an impressive 15 inches tall and 13 inches wide (it’s satisfyingly heavy too). The piece ships in a suitably large box (22 x 16.5 inches) and comes encased in two thick pieces of polystyrene. Everything about this statue is big. … that whittling the 60 or so I photos I took down to just half a dozen has a real challenge. 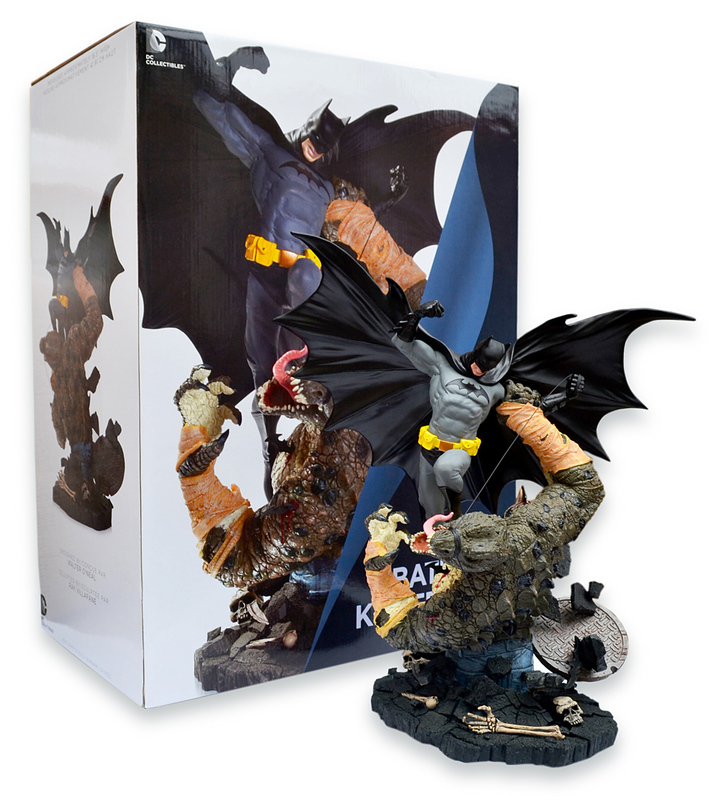 When it was released the Batman & Killer Croc statue, second edition, originally sold for a RRP of £235/$300. Since it’s been available for a while prices now differ widely (I’ve seen listings on ebay for over £500/$630) As always though it pays to shop around — I picked up mine for £115/$140 from Amazon. Not cheap I’ll admit, but I don’t begrudge the cost; this really is a terrific statue and a worthy edition to my collection. At the beginning of this post I mentioned that I had a fairly large collection of Marvel and DC statues (50+ and counting). However, due to a shortage of display room I’ve been forced to reign back on collecting over the last couple of years. Saying that though, over the last few months I’ve come across some irresistible pieces from DC Collectibles, and so have dipped my toe back in the collecting pool. First off was The Sandman Overture statue, which I’ve already looked at here. In the next week or so I’ll take a closer look at DC’s iZOMBIE statue, and finally, just in time for Christmas, I’ll finish off with another big piece: The Dark Knight Returns — Superman & Batman statue. Be sure to check back and read my thoughts on all three.